Last month, my cousin gave birth to a lovely baby girl that they decided to call Ella. Knowing that their baby would soon be born, I decided in January to try & make something for her. I browsed all the DIY things you can find on Pinterest and got my eyes caught by some lovely Kimono Baby shoes for which the blog Homespun Threads made a free pattern. 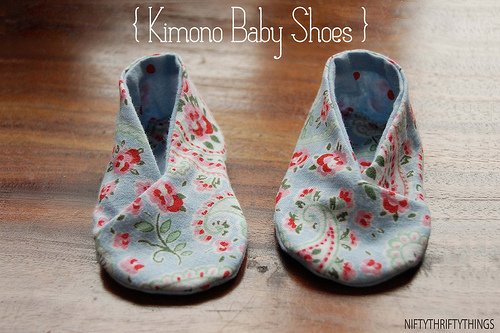 Kimono Baby Shoes, here made by the blogger NiftyThrifty Things, following Homespun Threads pattern. I decided to give them a go and for their making, I selected some pretty fabric from the Dashwood Studios which I found online from Sew Scrumptious – it has now sold out but you can still find it from The Homemakery. 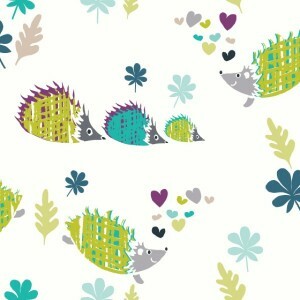 I also selected some lime and blue polka dot fabrics from this ebay seller. The baby shoes turned out really cute and were relatively simple to make. I ended making 5 shoes to get a matching pair in term of size, but that’s due to my lack of experience rather than the difficulty of the project. I would know make a new pair in no time. As making them was so fun, I also decided to make a matching pair for my cousin, thinking she would certainly love having already a matching outfit with a baby girl. I couldn’t find a free pattern for adult kimono shoes and didn’t feel confident to make one, so I purchased the Sewing Pattern for Women Kimono Shoes on Etsy (£4.49) from LenaShoesPattern. I used the same fabric than for the baby ones, with the addition of some anti-skid fabric for the bottom (I ordered mine on ebay here ) and some wadding to make them more comfy. And here is how both pairs turned! Matching kimono shoes for baby and mom! As I still had some fabric left, I thought that matching bibs would be a cute addition to the slippers, and I made a pair of those Reversible Bibs which are so easy to make. And voila! Matching baby kimono shoes and bibs! A few evening of work, some adorable fabric, and I had some lovely and unique presents to send to my cousin! What about you, have you ever made anything for babies? Have you got some patterns to recommend? Previous Previous post: 7 fabrics 100% cotton that will make you want to sew right away!